I love a good subscription box, and I have tried quite a few in the past. Most of the boxes I have tried are full of geeky goodness, beauty or with a lifestyle theme. I've noticed some book boxes on the scene, but most of them are from America and can be expensive to ship over to the UK. The UK based ones are a bit out of my price range, and with the risk that I won't enjoy the book or goodies, I'm just not brave enough to take the leap and pay for them. My friend Zoe from nosaferplace found a gap in the market for a YA book box that wasn't super expensive, and offered some bookish goodies along with a newly released YA book. She created the "Wildest Dreams Book Box" which is just £18 including delivery. After opening sign ups for a trial box, which was released in December, the Wildest Dreams subscription officially launched in January, and the first box with the theme "Into the Jungle" will be shipping out at the end of January. I have an exclusive code to share with my readers, but you must be quick as the boxes for January are almost sold out. To get your own box, visit the Wildest Dreams Book Box website and enter "AMUNDANELIFE" to get the box for just £15 including postage. The offer runs between 4th-10th of January so you better hurry before you miss your chance. Please could you tell us a little bit about yourself…. Hello lovely readers of A Mundane Life! I'm Zoe and I'm 23 years old. I'm a full-time blogger and YouTuber - and more recently, a business owner. My blog and YouTube are both under the same name, nosaferplace and I predominantly chat about all things bookish. Young Adult books have been my saviour for the past few years, especially since being virtually housebound from my chronic illness, PoTS. Can you tell us a little bit about the “Wildest Dreams” book box? 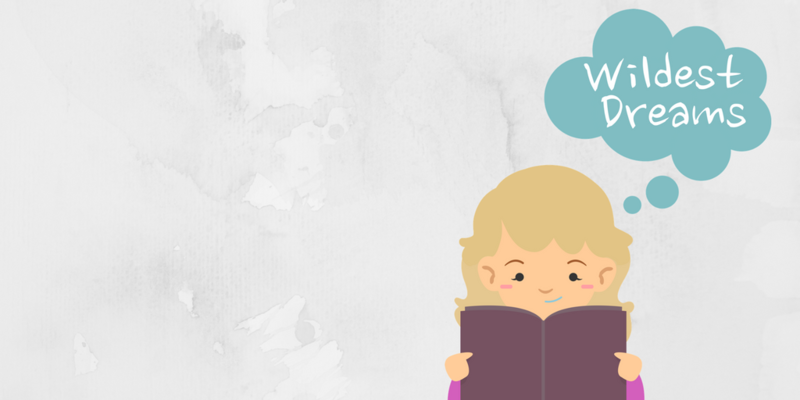 Wildest Dreams is a monthly UK based YA subscription box, that contains all things bookish (much like my blog). It's been described as the perfect self-care package and I couldn't put it better myself. 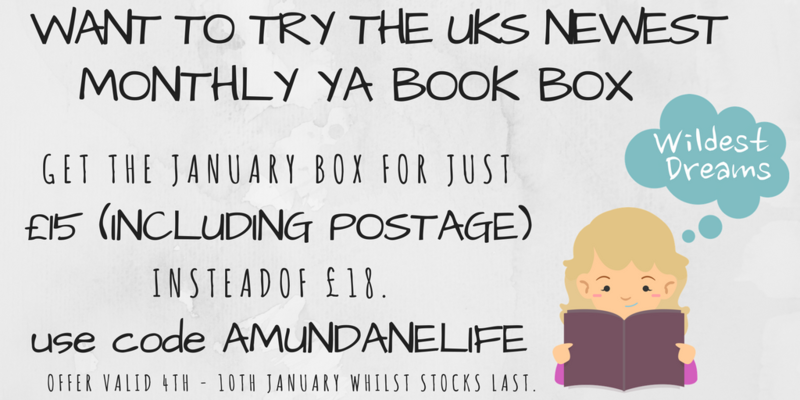 It's £18 a month with free UK shipping, and comes with a newly released YA book, bookish themed tea, a bath/body product and a few extra surprises. I had trained for 3 years to work in childcare. I absolutely adored the job but my health detoriated pretty quickly and I had to leave my vocation and was told by my consultants that I was unable to work. For 6 months, I moped at home, with little money and little motivation. Around September I came up with the idea of Wildest Dreams - and within a month, my first box was up for pre-orders and I sold out in 4 hours. It's very varied, mainly because I blog and YouTube at the same time too; which is also very time-consuming. Yesterday was a business-focused day. I got up at 7am, replied to some emails, tweets and DMs on Twitter (social media is such a hectic part of the job!). I chased up suppliers - again, this has to be done a lot. At 10am, I started packing the boxes as they are due out next week. Cutting 100 pieces of brown paper to the same size, tissue paper, making the boxes up, cutting out bookplates - just getting everything ready to go. It took a good few hours. Then I came back, talked through designs for products in February's box, designed compliment slips and business cards. Also did the graphic for February's theme reveal. And that took me up to 6pm when my husband came home and the dinner goes on! Your subscription box features a new book every month, what is your favourite book of all time? I know my followers know this just as much as I do, but it's always nice to talk about it some more to new people. It's a book called After the Fire by Will Hill, which was released last year. I've always been absolutlely fascinated with cults and this story of one teen's recovery into surviving the cult she has now left, alongside a psychiatrist, is utterly beautiful. I'm not going to be obvious and say something like Harry Potter. I really loved Everything, Everything. I know a lot of people had problems with it but I adored the film and thought it captured the book perfectly. Wow. That's a big question! I'm actually in talks at the moment with someone that has offered to work with me and their knowledge and experience would take my box to the next level - this is an exclusive! I'd just like to be continuing what I'm doing, really. I'm happy with 100-200 boxes a month and just continuing to make readers happy; that was my main aim for the the box. What advice would you give to others who would like to start their own small business? Just take the plunge. In my position, it was always worth it as I had nothing to lose. But it was still terrifying and nerve-wracking. Actually, it still is now! My second box is just about to go out and receiving feedback is probably the scariest thing of all! I think if you're that passionate about an idea, just go for it - what's the worst that can happen? Selling out my boxes. Is that a cheat answer? No, if I could be anywhere, it would be Disneyland Paris. Even for a day. I call DLP my home, it's so magical and will always have a special place in my heart. I want to say thank you to Zoe for creating a book box that doesn't break the bank and showing that you can change your dream and find something to do even with a chronic illness. Remember to visit the Wildest Dreams Book Box website and enter "AMUNDANELIFE" to get the box for just £15 including postage. You can find Zoe on twitter, her blog, youtube and her business twitter. If you run a blog/youtube channel, are an author or a small business owner and would like to feature on my blog, please send me an email and we can have a chat!